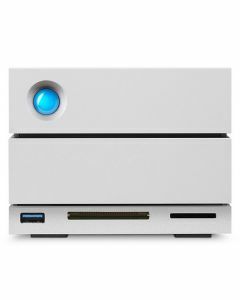 The new Lacie 2big Thunderbolt 3 dock conbines huge storage with multiple connectivity via SD Card slot, CF Card slot, DisplayPort, Thunderbolt 3 and USB 3.0 & 3.1. The 2big Dock gives back what modern laptops take away. If you think outside of the box, so should your storage. The LaCie 2big Dock delivers everything you expect from their products—high capacity, lighting-fast speeds, and enterprise-class drives—but it’s more than that. Port by port, slot by slot, they designed a powerful docking station that gives back to you everything that modern laptops took away. USB 3.0 Hub - Via the front-facing hub, charge your phone or connect a shuttle drive or digital camera to offload footage or files. Dual Thunderbolt 3 Ports - Power your laptop while simultaneously daisy chaining up to 5 additional LaCie 2big drives or other Thunderbolt™ or USB-C solutions. DisplayPort - Connect to high-resolution 720-1080p and 4K displays. USB 3.1 Port - Universal compatibility with USB-C and USB 3.0 computers via the included adapter cable. With up to 20TB of capacity for a massive raw-file library and Thunderbolt 3 transfer speeds of up to 440MB/s, the LaCie 2big Dock is built to keep you creating. Designed with the creative professional in mind, the LaCie 2big Dock features Seagate® IronWolf™ Pro drives and RAID optimization for superior power management and reliability. Thanks to the LaCie RAID Manager, you can easily monitor your system’s health with audible alarm and email alerts in the case of failure and warning events. And for added peace of mind, a 5-year limited warranty is included on your system. Power delivery (2big Dock Thunderbolt 3): Provides up to 27W (USB 3.1) or 15W (Thunderbolt 3) of power to charge USB-C laptops, such as the Apple® MacBook® or MacBook Pro®, while using the drive. Thunderbolt 3: Bi-directional, dual protocol, and supports dual 4K displays or one 5K display.